Another KAP attack on Jersey's west coast. 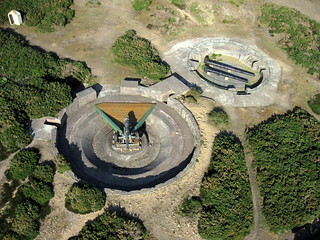 This German army battery was installed on the Les Landes heath in the spring of 1941. Its four 15.5cm guns, captured French artillery pieces, commanded the sea approaches to St Ouen’s Bay. They were all dumped over the cliffs at Rouge Nez after the war. The gun that points out to sea from its emplacement today is one of the originals, raised from the ‘elephant’s graveyard’ in the 1990s, along with other salvaged coastal artillery pieces, also on display nearby. Moltke Battery’s labyrinth of underground bunkers have been dug out and restored by the Channel Islands Occupation Society. Walking across the flowering heath with lark song overhead is a strange and poignant experience.